Colossloth released his second album late last year, the record ‘continues his esoteric sonic crusade of volatile yet absorbing audio textures. Cold electronica, with swathes of rhythmic power noise and industrial harshness, tempered with penetrating song structures.’ Which all sounds great to us, read the review below. Let me say right from the very start of this review that this collection isn’t easy listening. It’s not an album to stick on in the car when you’re driving the family to see your Nan. It’s not the soundtrack to a sunny day on the beach. There is music for such occasions, but it’s not Colossloth. This is a record of sound. It feels like a radio broadcast from the depths of space, a stark, static filled communication from beyond. A robotic whale swimming through a black sea of sine waves. Colossloth has created an album far beyond his last release. There are moments of fragile beauty, odd piano interludes and electronic vocals but these are soon lost in the overwhelming sea of static, pulses and drone that Colossloth has taken in hand and moulded to his will. There is the horror soundtrack of ‘A Place Where Your Dreams Can Die Alone’ in which you know that something with talons and red teeth is just behind you as you walk. There is the deep low hard dirty anger of ‘We Had A Pact’. I could go on, but you really need to listen to it and discover it for yourself. There are moments of fragile beauty, odd piano interludes and electronic vocals but these are soon lost in the overwhelming sea of static, pulses and drone that Colossloth has taken in hand and moulded to their will. There is the horror soundtrack of ‘A Place Where Your Dreams Can Die Alone’ in which you know that something with talons and red teeth is just behind you as you walk. There is the deep low hard dirty anger of ‘We Had A Pact’. I’m not dissecting each track though, that’s for you to feel when you listen to it. This is for the people on the fringes who love noise, who embrace the sound and touch of it. Colossloth has taken the noise and embraced it. 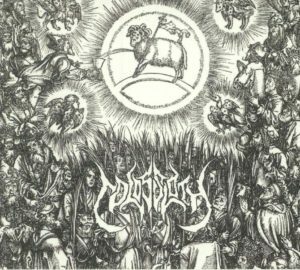 Colossloth’s last album Outstretch Your Hands For The Impress Of Truth was excellent, Heathen Needles takes us further out and further on. You get eleven tracks, but they all flow together to make one huge statement of sound. A brilliant sculpture of noise and emotion. Colossloth’s album available from the Cold Spring Bandcamp page. He is also on Facebook.